Don't let grammar goofs and mechanical missteps undercut your professionalism. In this program, Nancy Flynn will review "grown-up" grammar rules for CSU professionals. We'll cover punctuation, capitalization, and evolving grammar guidelines including gender-neutral and preferred pronouns. You'll learn to write correctly - and more quickly. 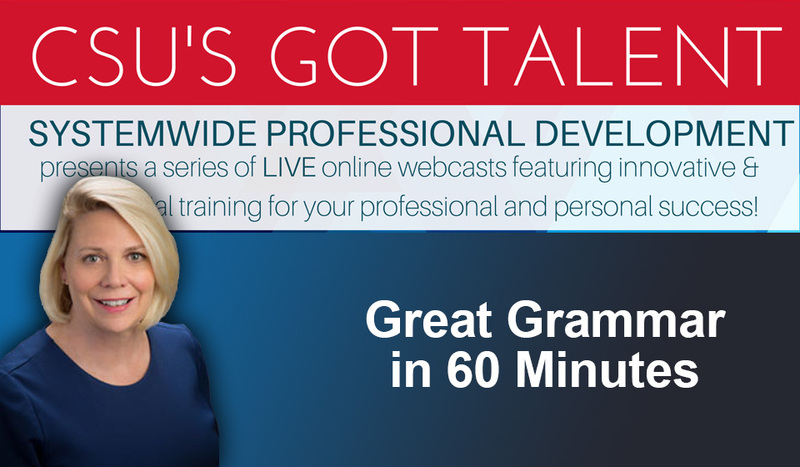 If you haven't had a recent review, Great Grammar in 60 Minutes is for you. Founder of Nancy Flynn Public Relations, Inc. and its Business Writing Institute™ and ePolicy Institute™ training divisions, Nancy Flynn is a recognized expert in traditional and electronic communication. The author of 13 books published in six languages, her titles include Writing Effective E-Mail, The ePolicy Toolkit, and The Social Media Handbook. An in-demand trainer and business writer, Nancy Flynn has helped clients worldwide improve their writing. An authority on e-policy and compliance, she is an expert witness for the government and law firms in litigation related to policy and the web. A go-to media source, she often is in the news. Nancy Flynn has served as an adjunct faculty member at The Ohio State University, teaching business and technical writing to graduate and undergraduate students.